Orange is one of the most nutritious fruit of winter season. Orange fruit is found in various varieties but usually have oval to sphere shape with sweet to bitter and sour taste. The sweet ones are the most commonly consumed and popular varieties. Internally the fruit flesh is composed of segments, called carpels, made up of numerous fluid-filled vesicles. Externally the thick and leathery orange peel contains many volatile oil glands in pits. The thick bitter and porous rind is usually discarded or preserved to be used in various facial masks or packs for beautiful skin. Orange like other citrus fruits is an excellent source of vitamin C which is a powerful natural antioxidant. In addition to Vitamin C, phyto-chemical antioxidants, soluble and insoluble dietary fiber have been found to be helpful in reduction in the risk for cancers and coronary heart diseases. In addition to that, oranges are also a good source of amino acids, beta-carotene, folic acid, potassium, calcium, copper, phosphorus, iron, manganese, sodium and zinc. A compound called limonoids, usually found in Oranges and other citrus fruits fights against various cancers like colon cancer, lung cancer, skin cancer, breast cancer etc. Anaemia is a condition that generally occurs due to insufficient red blood cells in hemoglobin. Iron deficiency is the leading reason behind this situation. Orange juice provides a good quantity of vitamin C that promotes the absorption of iron into blood stream. That’s why most doctors suggest the anemia patients to consume orange or its juice on regular basis. Due to the presence of Vitamin C and many other anti-oxidants orange juice acts as a best defender for you against several infectious diseases (such as flu or colds), promoting the immune system. Drinking orange juice regularly prevents kidney diseases and reduces the risk of kidney stones.The risks of formation of kidney stones can be reduced by taking one serving of orange juice on regular basis. Too much concentration of minerals and chemicals usually result as the development of kidney stones. Orange juice contains citrate, which has an excellent ability to prevent this disorder by decreasing the urine acidity. So the individuals, who are suffering through this terrible condition, should include fresh orange juice in daily diet plan. Oranges also help a lot in prevention of heart disorders. Hesperidin is a plant based substance that protects the arteries from being clogged by improving the health of nearby cells. Oranges contain hesperidin in sufficient amount, thus consumption of one glass freshly squeezed orange juice or consuming one orange ensures lower risks of heart attacks.The high amount of Vitamin C and flavonoids also protects against many heart diseases. Orange juice is the amazing drink for the patients of high or low blood pressure. Orange contains a significant amount of magnesium which has a wonderful ability to bring back the disturbed blood pressure level to normal range. Hesperidin and Pectin present in Oranges lowers bad cholesterol. It helps the body to slow down the absorption of fats that contribute to dangerous levels of cholesterol. A high fiber content in oranges help stimulate the digestive juices, thus improve digestion and relieve from constipation. Due to its anti-inflammatory properties, it helps in relieving arthritis pain and stiffness of muscles and joints. In a study at the Arthritis Research Campaign Epidemiology Unit in the UK, suggested that one glass of freshly squeezed orange juice per day is associated with a reduced risk of developing inflammatory disorders such as rheumatoid Arthritis. Regular consumption of orange juice is helpful for cutting down the extra pounds, claiming that this citrus fruit is full of antioxidants, which act efficiently to lose weight.Oranges are very low in calories and rich in fibers which make you feel full for long thus making you eat less. Oranges are rich in calcium. The high level of calcium in oranges helps to keep the bones and teeth strong. Daily consumption of orange fruit as well as juice, both are highly beneficial to maintain healthy bones and teeth. Orange is also good for men because it helps keep their sperm healthy. According to recent scientific studies, there is a compound in orange called folate. Folate is said to contain nutrients good for the health of a sperm. Folate besides keeping the sperm healthy also protects it from genetic damage. High Vitamin C contents in Orange bring a natural glow to your skin. Orange peels are a natural bleaching agent that can lighten dark patches on the skin and effectively remove them with time. Moreover, they help in reducing suntans by deflecting harmful UV rays from attacking skin cells. Orange peel face mask not only lighten your complexion but also reduce blemishes and acne scars and give you fair glowing and even skin tone. You can prepare this mask by following giving instructions. Take some dried orange peels and grind them to make fine powder. Now mix this powder with some curd. Apply this on your face and neck and let it stay for few minutes then rinse off with fresh water. 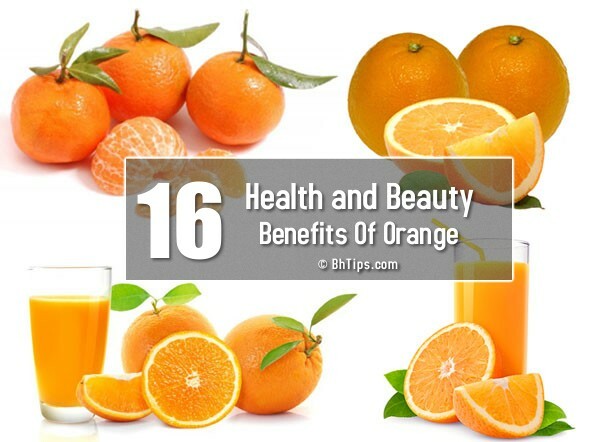 Orange also help a lot in curing acne and pimples. Excess dirt, soot, oil or bacteria block your skin pores, resulting in the occurrence of pimples. Oranges have a high content of citric acid which is effective in drying away acne. You can cure the problem of acne by following given instructions. Grind orange peels to make a paste. This will not only cure acne but also balance skin oil. Orange peel mask is very effective in removing skin blackheads. You can prepare this mask by following given instructions. Mix one part yoghurt with orange peel powder to make a thick paste. Apply this paste on your nose and face. Now use gentle circular motions for 2-3 minutes. Finally wash off with lukewarm water after 15 minutes. Oranges are a rich source of Vitamin C which helps in restoring collagen in your body which is responsible for skin firming and prevents premature ageing of skin. Oranges contain powerful antioxidants which fight off oxygen free radicals that deprive the healthy skin cells of oxygen by stealing oxygen molecules from them. These free radicals often cause wrinkles and sagging of cheeks. Nutritive Value per 100 g. Total-ORAC- 1819 µmol TE/100 g.